X Server Review 2019: Is X Server a Good Hosting? X server is a Japanese website hosting company providing high quality technologies to everyday users and professionals alike. Serving over 1.5 million active websites, X server is a leading provider of web hosting solutions in the country. Founded in 2003, XServer is a web hosting company based in Japan. They currently serve over 1.5 million operational websites and stand as one of the top providers of web hosting in the country. They market primarily to a Japanese customer base, so their website and service are only available in Japanese. What I liked about XServer is that they provide reallyhigh-qualityy technology to regular website owners. For example, all plans come with SSD RAID 10 configuration as standard. This is basically the latest in high-performance servers, with disk reading speeds improved by up to 48 times from HDD. In addition, XServer boasts a high-spec server environment equipped with the latest 24-core CPUs. I also appreciated their provision of a one-click installer, which enables users to quickly and easily install popular programs such as WordPress. For beginners, this feature is very helpful. Since XServer is a Japanese web hosting company targeting mainly Japanese users, they don’t have data centers located in other countries at present. Given their apparent lack of a CDN, this may be problematic for Japanese webmasters wishing to reach out to an international customer base. Furthermore, they only seem to offer basic shared hosting services — albeit shared hosting with very high storage space allocations — so users hoping for a VPS or dedicated server option will be left disappointed. However, for the most part, XServer is a highly reliable platform for those who are satisfied with their high-capacity shared hosting plans. XServer is quite expensive compared to international and Japanese hosting providers. However, you do get a lot of features for your money, such as the SSD RAID 10 configuration and NGINX optimized web servers. For me, these value-added features make the extra cost viable. In terms of contract length, they only list annual rates along with an initial server setup fee. It was disappointing to see that they charged for setup, considering that most hosting providers would waive this; however, this seems to be the norm with Japanese and Korean web hosting providers. They don’t offer a monthly billing period or free plan, but they do offer a ten-day free trial and as a limited time offer, a free domain registration. One major downside is their customer service options, which are pretty limited. They offer email and phone support between 10AM and 6PM on weekdays; there’s no live chat or Facebook messaging option. In fact, they’ve disabled the message button on their Facebook page. Ideally, I’d really like to be able to contact them much more conveniently. For me, excellent service requires some form of instant messaging plus much longer business hours. XServer does offer some great added value, including a professional suite of features even for everyday users. All their plans give you a ton of storage space though, which means you may be paying more for resources you won’t actually need. 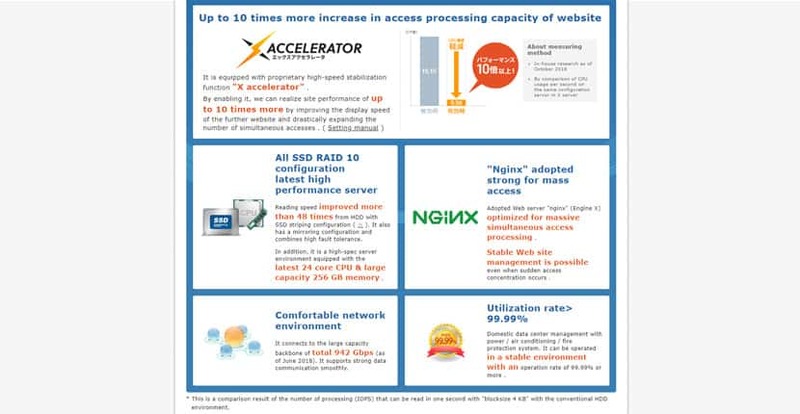 Wondering how X Server stacks up against other Web Hosting companies? Enter any other Web Hosting company and we will give you a side-by-side comparison.